WASHINGTON — The Federal Trade Commission is in the advanced stages of its investigation into whether Facebook violated privacy rules and is expected to seek large fines from the company, according to two people familiar with the inquiry. The five members of the commission met in mid-December to discuss the investigation, according to the people, who would speak only on the condition of anonymity because the investigation is not public. The meeting is a sign that the investigation is far along, the people said, because the commissioners rarely meet in the early stages of an inquiry. The investigation, which began in late March, is continuing, and the commissioners and staff have not reached a final conclusion, including how much the agency might seek in fines, the people said. Consumer-protection and enforcement staff members have provided updates on what they believe is evidence of privacy violations, but they have not submitted a final report. The commissioners would vote on any recommendations from the staff, including whether to pursue fines or other penalties. They do not always approve staff recommendations. The Federal Trade Commission declined to comment. Facebook, which has repeatedly defended its actions, also declined to comment. The Washington Post earlier reported about the meeting and the potential for a record fine. The investigation is seen as a litmus test of the government’s ability to protect consumers in the digital age. All five commissioners have testified to Congress that they need more resources to go up against big corporations in enforcement actions. Their agency does not have the authority to create privacy rules, but it can police businesses through a broad mandate to protect consumers from deceptive and unfair practices. The investigation into Facebook began with revelations by The New York Times that a British political consulting firm, Cambridge Analytica, had obtained data from tens of millions of Facebook users without permission. 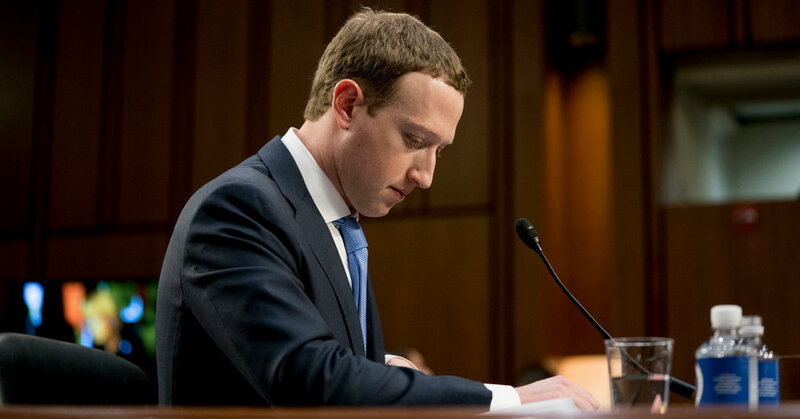 The report ignited calls for investigations by global regulators and the summoning of Facebook’s chief executive, Mark Zuckerberg, to testify before Congress last April. A consent decree from 2011 requires Facebook to seek permission from users of plans to share their data with third parties. The trade commission also requires Facebook to notify it when third parties misuse user data. Over the past nine months, enforcement and consumer-protection officials have looked into a series of additional reports by The Times and other publications that raised questions about whether Facebook’s use of data violated its consent decree, according to former officials. The expanded investigation included Facebook’s partnerships with hardware and other tech giants like Netflix and Amazon that gave other companies access to Facebook user data without explicit permission. Facebook has said Cambridge Analytica told it that the firm had deleted the data. The social network has hired scores of lawyers and privacy experts to handle the commission’s investigation, and Facebook’s top privacy officials and lawyers are in regular conversation with officials leading the investigation. For 17 months of the Trump administration, the Federal Trade Commission was run by two commissioners. In May, the new slate of commissioners arrived, all appointed by President Trump. Three members are typically from the president’s party, and two from the other party. The agency’s chairman, Joseph J. Simons, an antitrust lawyer, has declined to comment about the investigation. He has sent strict orders throughout the agency against leaking information about the inquiry to reporters. One of the people familiar with the investigation said the meeting last month, though unusual, had been called partly because three of the commissioners were new, and because the case warranted an update from enforcement and consumer-protection staff. The people said the investigation had been slowed by the government shutdown, now in its fifth week. The hallways at the agency are empty, and just the five commissioners and a smattering of other employees have arrived for work during the shutdown. Previous PostPrevious His Art, Their Ideas: Did Robert Indiana Lose Control of His Work? Next PostNext Why Do We Hurt Robots?